Thanks to Brittany letting me borrow this wig, I’m going as Princess Celestia to Equestria LA. Let’s make some pony stuff. 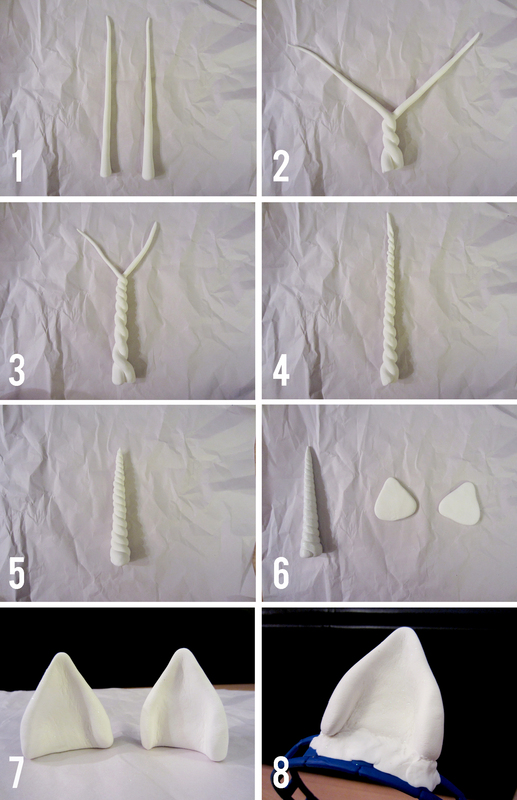 First, the clay items: unicorn horn and ears. Just gotta say that this project has to be done at least 24 hours in advance if using Model Magic. I only gave myself 8 hours and the clay hadn’t hardened yet, which sucked. Step 1: For the horn, roll out two skinny cones of clay. Step 2: Twist the cones together starting at the base. Step 3: Keep twisting them together, being careful not to just simply twist one cone around the other. Step 4: Until you get to the top. Step 5: Pinch off any excess clay to get the desired length. Step 6: Roll the horn so is smoothes out a little and the two cones blend into each other. At this point I covered it in iridescent glitter. In retrospect, I’d rather mix the glitter into the clay beforehand. To start the ears, flatten out two pieces of clay into triangle shapes with rounded corners. Step 7: Flatten out the bottom of the ear pieces and curve in the sides to create dimension. Step 8: Attach the ears and horn to the hair accessory of your choice with more clay. I used a plastic headband, but an elastic one or clips work as well. Next, the glittery foam stuff: crown and cutie mark suns. The easiest part was shaping Celestia’s crown out of a pre-made one from Michael’s. I added purple gems with some Elmer’s glue. Here’s an easy way to make a temporary cutie mark. Step 1: Celestia’s cutie mark is a sun with 8 rays. For this I used an adhesive glitter foam sheet. I traced a circle and divided it into 8 even parts. Step 2: I made a stencil for one sun ray making sure the width is the same as one eighth of the circle’s circumference. Step 3: Trace the ray 8 times. 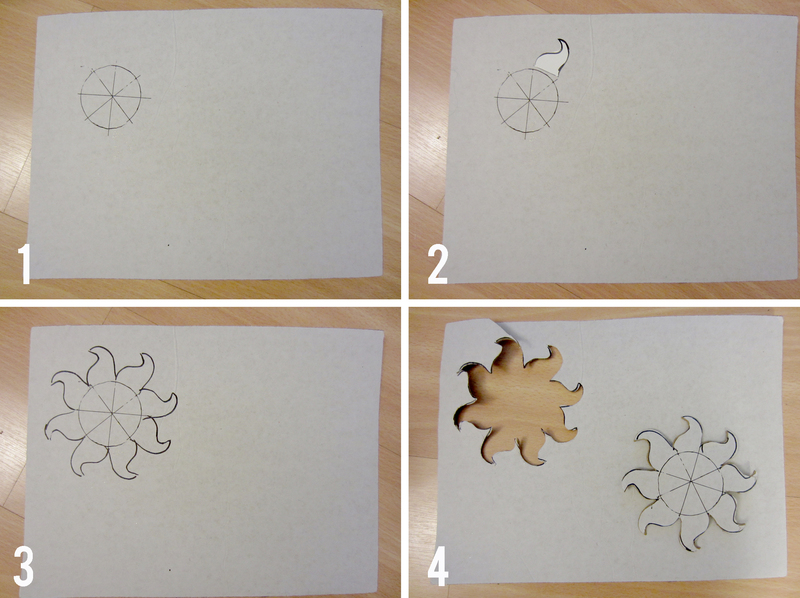 Step 4: Cut out the sun shape and use it to trace and cut out another. Now you have one for each flank! Here’s the full costume! Followed by my awesome coworkers (Kelsey as Doctor Whooves, Steph as Misty the Wonderbolt, Joe as Fluttershy, Ed as Twilight Sparkle from the future, and Mallory as Nightmare Moon – a very friendly Nightmare Moon). I don’t know the people in the last two pictures, but their half Cadence half Changeling and Derpy costumes were too fun to not post. Princess Celestia Wig | Borrowed from Brittany! omg Tracy I’m so proud of you, i’m gonna cry. everything looks awesome! Great DIY!! Where did you fasten the horn? The headband I used has a good width, so I just attached it to the top with more clay and let it dry. I believe this one is from Michael’s craft store. Thanks for the tutorial! One question though, did you attach the horn after it had hardened or did you do it while soft? Hi Maria! While it was soft so it would harden around the headband. Thanks for stopping by! Thank you so much for creating this post. It was helpful when I created my pony ears and horn. Just so you know, mixing glitter in model magic does nothing. It soaks it up like a sponge and then you don’t see any glitter. I painted mine white after they had dried and then covered the wet horn and ears in glitter. Works pretty well so far. Thank you for the tip about the glitter! Thanks for this! My daughter loves Twilight Sparkle but wants to be something else involving a horn for Halloween – a tigercorn – a tiger/unicorn/pegasus, in pink, of course. Hers is drying now – fingers crossed! Hope it turns out magnificently!! Just an FYI for those looking. They now sell a glitter sealer for model magic clay, in both silver and gold, as well as a shiny sealer. Have not used it myself. But making some ears and noted it. i need to get some clay where can i get it from? Michael’s craft stores have great options for clay! 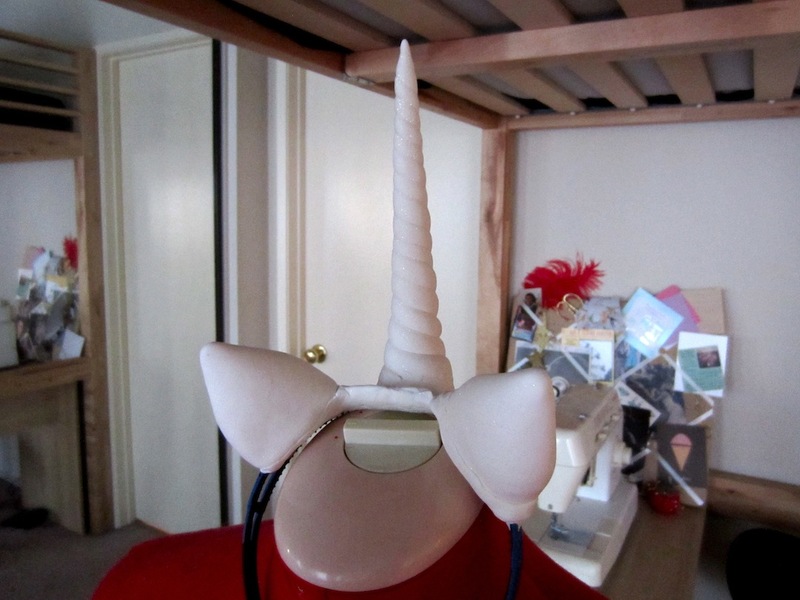 How much model magic to make the unicorn ears? A small amount – about the size of a golf ball for each ear. So strange, I’ve never had a problem using model magic! I have yet to see it break, but I will definitely check out Plastimake/Thermomorph. Thank you for the suggestion!